MEGAFORCE deals with an elite phantom army led by headband wearing Ace Hunter (Barry Bostwick) charged with stopping a band of rebels from wiping out a fictional middle eastern country located somewhere in Arizona. 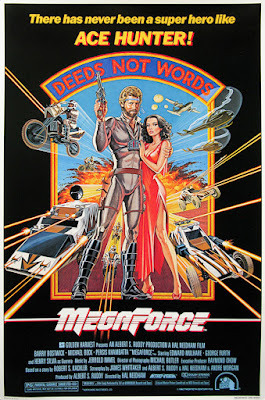 What follows are 99 minutes of flying motorcycles, disco jumpsuits, bad rear screen projection, and permed hair. This action missile misfire is available for streaming on Amazon, but as always, you're better off leaving the cinematic headband wearing to us and finding some other action spandex to wear. Special shout out to the 1980's Movie Graveyard podcast. 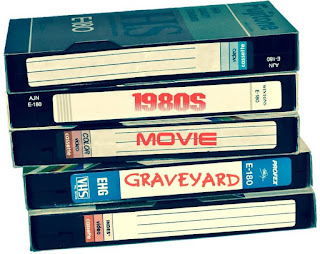 Movie Graveyard features a running commentary for some of the most creative, weird, and unique films released between 1980-1989. You can follow them on Twitter @80sMveGraveyard.